Summer has left the northern hemisphere for another year. California’s Indian summer is hanging on in there and giving us some great outdoor weather to enjoy the last evenings of the year, but don’t let it fool you, the holidays are just around the corner. When we can’t set up tents to make things more beautiful outside, we move inside and make things more beautiful there. 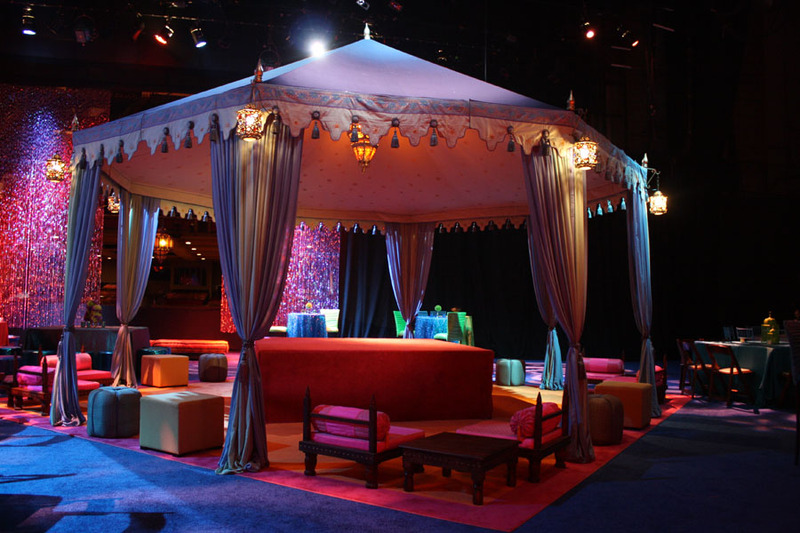 Ballroom transformations are a specialty for Raj Tents, as well as transforming private residences to provide a strong theme and rich colors to make your holiday party come to life. 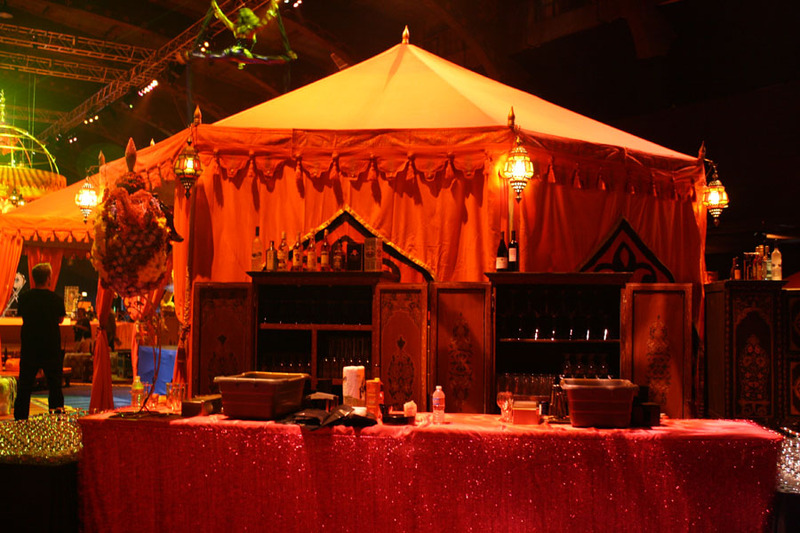 The pictures shown are of a big theme bash at the Shrine Auditorium in Los Angeles. Grand Pavilions in reds and oranges created a strong center line either side of the stage, with Pergolas lining the overhang of the balcony set up as bars. The central dance floor had a fabulously scalloped lighted crown above it, hung with Raj Tents Moroccan lamps. The stage area was filled with Raj low lounge furniture vignettes and all tents were lit with Raj jewel perimeter lamps and center lamps. The result was magical. 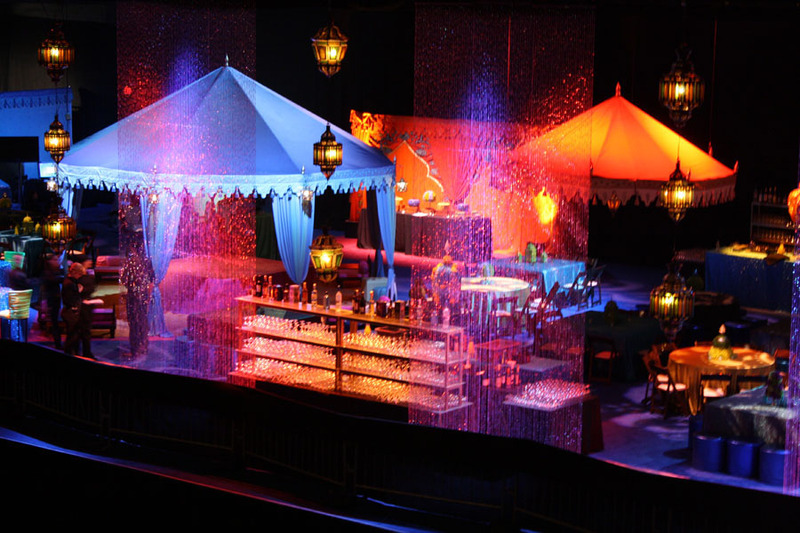 The Shrine’s stage was set up as part of the party, with a bead curtain with Raj Moroccan lamps as the screen to the vastness of the auditorium itself. This area was colored in cool aqua tones with some hot reds to pop out against it. The poppiest of the pops was a fabulous floating Pavilion canopy that appeared to be levitating. Raj lounge furniture, lighting and some Pergola lounges for those wanting to retreat into a more sheltered zone finished off the scene. If you are planning a holiday party and want a good strong theme to carry the day, get in touch with us in Los Angeles or San Francisco to see how we can help. Inquiries for installations outside California are welcome too. Put some sizzle back into your holiday party, you don’t need to party like its still 2005, but you don’t need to stay in mourning either.